Nigerian actress Caroline Danjuma, earlier today made some interesting allegations against Davido. She took to Instagram to call out the singer asking him explain the whereabout of her brother. Story is, Davido and some of his friends including Caroline's 'brother' Tagbo had gone clubbing at DNA in Lagos. When the returned, Tagbo sadly was not with them. Caroline reportedly got a call that a dead Tagbo was dumped at General hospital. 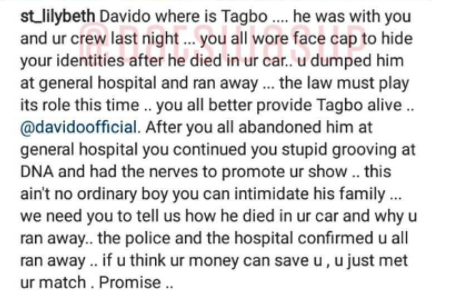 Davido where is Tagbo …. 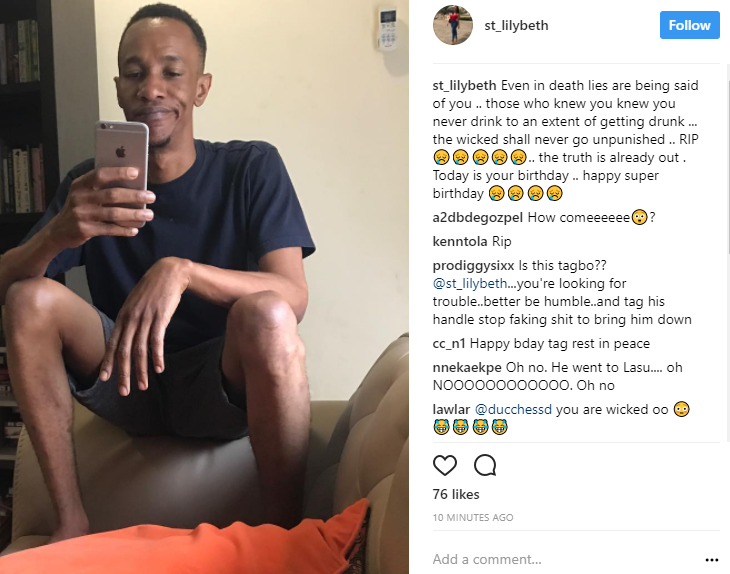 he was with you and ur crew last night … you all wore face cap to hide your identities after he died in ur car.. u dumped him at general hospital and ran away … the law must play its role this time .. you all better provide Tagbo alive ..@davidoofficial. After you all abandoned him at general hospital you continued you stupid grooving at DNA and had the nerves to promote ur show .. this ain’t no ordinary boy you can intimidate his family … we need you to tell us how he died in ur car and why u ran away.. the police and the hospital confirmed u all ran away .. if u think ur money can save u , u just met ur match . Promise.